Atmospheric carbon dioxide levels were much lower during the last Ice Age because unusually high silica levels in the Pacific Ocean bumped up oceanic plant-life. The research provides valuable insight into the role of the oceans and nutrients in regulating the Earth's climate, and could prove indispensable in predicting ecosystem responses to climate change, according to Australian scientists. "This is the first time that scientists have had a complete historical picture of nutrients in the Southern Ocean. These findings allow us to better understand the role marine plants will play in the marine carbon cycle and how it is likely to be impacted by fossil fuel burning," said environmental chemist Bill Maher from the University of Canberra, a co-author of the study published in Science. Marine phytoplankton play a vital role in the removal of carbon dioxide (CO2) from the Earth's atmosphere, but their growth is limited by the availability of nutrients such as nitrate, phosphate and silica. Silica in particular is necessary for the growth of diatoms – one of the most common types of phytoplankton – which accumulate the compound in their cell walls. During the last glacial period, 110,000 to 12,500 years ago, atmospheric CO2 was around 200 parts per million lower than it is today. Scientists speculate that the relatively low atmospheric CO2 levels were attributable to increased diatom productivity. This latest research provides evidence that silica occurred at higher concentrations in the Pacific Ocean during the last glacial period than it does today. The product of higher silica concentrations would have been greater primary productivity, in the form of diatom growth, and faster rates of carbon fixation via photosynthesis. A comparison of the silicon isotope composition of sponges from two deep-water cores in the Southern Ocean – one in the Pacific sector and one in the Atlantic sector – enabled the researchers to evaluate the relative distribution of silica in the Southern Ocean over the last 150 thousand years. "We determined the silicon isotope composition of sponge spicules from the Atlantic and Pacific sectors of the Southern Ocean and found higher silicic acid concentrations in the Pacific sector during the last glacial period," the researchers wrote in their paper. "We now know that there was more silicic acid leaking out from the Southern Ocean into the Pacific Ocean where it stimulated diatom growth" said oceanographer Michael Ellwood from the Australian National University in Canberra, and lead author of the study. The finding supports the so-called Silicic Acid Leakage Hypothesis (SALH). The SALH purports that iron fertilisation of surface waters during the last Ice Age – a consequence of more dust being present in the atmosphere – reduced silicic acid utilisation by diatoms in Southern Ocean waters, relative to the uptake of nitrate and phosphate. Transported by the ocean conveyor belt, excess silicic acid in the deep waters of the Southern Ocean would have upwelled in the Pacific where it stimulated diatom growth. This is exactly what the deepwater cores studied by Ellwood and his colleagues show. According to marine climate change scientist Will Howard of the Antarctic Climate and Ecosystems Cooperative Research Centre in Tasmania, who conducts similar research, "it's a really important contribution because any data we gather on the way that silica as a nutrient was being cycled in the oceans in the past really gives us an insight into how the ecosystems were structured." "Similarly, anything we can do to reconstruct how nutrients were cycling in the past also tells us how carbon was cycling in the past," said Howard. "We've done two sites in the Southern Ocean but we'd like to do more to see how consistent the pattern is," said Ellwood. 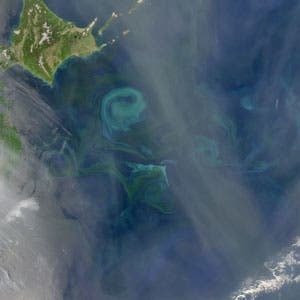 Image top of page: Phytoplankton bloom of the coast of Japan in the Pacific Ocean. Marine phytoplankton play a vital role in the removal of CO2 from the earth’s atmosphere, but their growth is limited by the availability of nutrients such as nitrate, phosphate and silica. Courtesy of NASA.